The ten-strong field for Saturday's Betfair Tingle Creek at Sandown should make for a fascinating race. 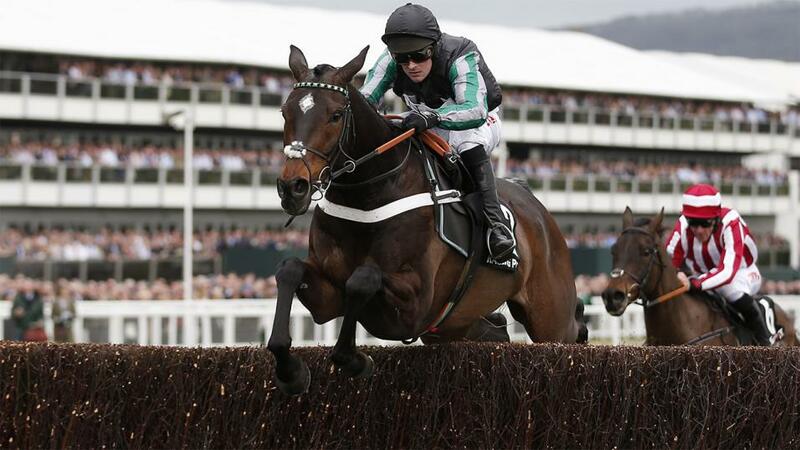 But there's no doubt that Altior is a worthy favourite, says Tony Calvin. "To add horror to fear for those who fancy their chances against him at the weekend, Altior is also three from three at Sandown and he quite clearly goes superbly when fresh... "
The return of Altior in Saturday's Betfair Tingle Creek may do little for the numbers and the prospect of each-way betting on the day (the race was re-opened on Monday), but the meaningful opposition - those who are fit and healthy - could still rock up. In fact, there are a very decent 10 entries, as it stands - indeed, it has the potential to be a cracker - and Altior is 5/6 with the sponsors. Quite how considerable a challenge the likes of Saint Calvados and Sceau Royal can mount we shall see on Saturday, but a mere glance at Altior's record underlines its formidable nature. Since finishing in midfield in a Punchestown bumper in April 2015, Altior is unbeaten in 14 starts over hurdles and fences, taking in six 1 Grade 1 victories, among them a Supreme, an Arkle and a Champion Chase. And to add horror to fear for those who fancy their chances against him at the weekend, he is also three from three at Sandown and he quite clearly goes superbly when fresh, as a certain Politologue found out at Newbury in February (Altior's first run back after a wind op). Of course, time, and defeat, catches up with every horse eventually, but he is still just an eight-year-old and that reverse-in-waiting won't be coming here if he runs up to the form of his superb seven-length defeat of Min at Cheltenham in March. But he does occasionally offer some hope to his opposition, and his pre-race layers, in running when he hit his customary flat spot in races, however fleeting. He traded at [8.4] in the run against Min at the Festival, and he hit evens en route to beating Charbel in the Henry VIII at this meeting in 2016 (by the way, this year's renewal of the 2m novice chase looks red-hot with such as Lalor entered in a Grade 1 that has also attracted 10 at the five-day stage). You could argue that the presence of Saint Calvados here actually makes life easier for Altior, providing of course Harry Whittington's five-year-old doesn't set too steady a pace. He certainly didn't when going off like a scalded cat with Petit Mouchoir in the Arkle - and there is plenty of pace opposition in here, which should suit the favourite - but that run is obviously easily, and possibly best, forgotten. His Kingmaker win at Warwick marked him out as a serious tool, and his Naas return promised a successful season to come, even if some will try and belittle the form given that Footpad not only fell (when held at the last) but returned with an over-reach injury. It is surprising to see that he is still only five and, having just his sixth fencing start, he clearly represents a worthy rival to all in the 2m chasing division unless we see otherwise. And then we have Sceau Royal, who would surely have gone very close in the Arkle judged on his Henry VIII win here last year before going on to win the Lightning at Doncaster. He had to miss the Festival with a "tweak on a suspensory" but he looked on good terms on his comeback defeat of Simply Ned in the Shloer last month. You certainly can't go overboard about the form - the runner-up is rated only 157 and was giving Sceau Royal 3lb - but it was a good stepping stone to taking on the bigger boys and his slick and accurate jumping is a great asset. The probability of soft ground, or maybe deeper, is not ideal for him, though. Willie Mullins has the option of running Un De Sceaux, Great Field and Min here - Footpad needs more time, and is due back over Christmas, it seems - and, of course, all three have to be afforded plenty of respect. Given the winning strike rate of these top-class chasers, it seems pointless to mention that Un De Sceaux is a potent force when fresh (although Special Tiara usually needs a run or to put him spot on), and he was making his reappearance when winning this race in 2016. He may have been put in his place by Balko Des Flos in the Ryanair last season and is getting on for 11 now, but you can set your watch by his performances in the top grade. It will be interesting to see how many of the three Willie runs, bearing in mind he had seven in the Ladbrokes Trophy and none ran. It is currently good to soft at Aintree, but it looks like there is a fair bit of rain due there on Wednesday. Theatre Territory is surely the horse to beat in the Becher after a superb comeback run at Cheltenham. She mixed it with the likes of Mister Whitaker and Ms Parfois last season, but she ran a career-best when just hauled in on the run-in on her reappearance, after travelling superbly and jumping her rivals silly for most of the contest. That was her first run after a wind op, and last year's Topham third looks to have come back an improved mare. Indeed, because the handicappers weren't allowed to raise her for that defeat - it's a new (ish) rule - she is unofficially well-in here. I'm sure I read somewhere that the handicapper would have raised her 7lb to a mark of 139 if he could have done - in fact, I know I did - so she has an obvious chance. She is currently 2lb out of the handicap, so connections will want the weights to go up. The Betfair Sportsbook make her the 7/1 third favourite behind the Nigel Twiston-Davies pair of Ballyoptic and Blaklion. The Grand Sefton has attracted 19 entries at the five-day stage and Twiston-Davies also supplies one of the market leaders here with Crievehill. More of that race, and the rest of the ITV fare (eight contests in total) - the Grade 2 Many Clouds looks a bit light on class on the Aintree card - on Friday afternoon.